With the purpose of celebrating the inclusion of the No Hate Speech Movement in our collaborators’ network, we present you this video that explains what hate speech is and how we can fight it. Through this agreement, the No Hate Speech Movement becomes part of our collaboration platform, through which we try to encourage the exchange of information among the associations active in the fight against islamophobia and the organization of joint actions. According to the European Council, hate speech “comprises all forms of expression that promote, encourage, spread or justify racial hatred, xenophobia, antisemitism, or any other kind of hate based in ethnocentrism, discrimination, and hostility against minorities, immigrants or people of migrant background”. Sadly, this type of speech is very hard to control and, often enough, finds its way in the media, the internet, and even the political field. Internet and anonymity have contributed considerably to the rise of hate speech in the last years. This increase makes it more necessary than ever to face this type of discrimination. In order to do so, the No Hate Speech Movement was conceived as a youth project launched by the EU’s European Council with the aim of fighting Islamophobia. 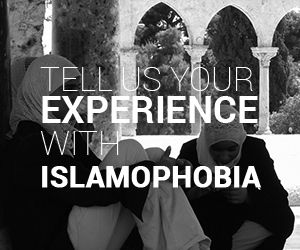 This initiative began in 2012 and it has managed to gather thousands of people from all over Europe, raising awareness about this problem, encouraging its rejection, and providing the necessary educational material to face it.